In one of the many worlds of the Multiverse, Miles Morales is a gifted student living in Brooklyn. He has loving parents and has recently begun classes at an elite boarding school in New York. However, he feels like he’s not in control of his life and he just wants to return to his friends back home. One of the few people he feels he can trust is his Uncle Aaron who encourages him to find himself. Miles’ world is turned completely upside-down when he’s bitten by a radioactive spider. It gives him the powers of Spider-Man but he’s completely unable to control his newfound abilities. As he seeks out the answers to how he got his powers, he runs across the real Spider-Man who desperately needs Miles’ help. The Kingpin has built a collider that threatens to rip apart their world. Without Miles assisting Spider-Man, the world is doomed. But as Kingpin fires up the collider, it opens up portals between the worlds of the Multiverse. Individuals with Spider powers are pulled from five different alternate realities into Miles’ world. One such Spider-Man is from a world where he has lost his marriage to Mary Jane, lost his motivation, and lost his drive to be Spider-Man. And unfortunately he’s the only one who can help Miles master his new powers and save the world. Spider-Man: Into the Spider-Verse is rated PG for frenetic sequences of animated action violence, thematic elements, and mild language. I am a lifelong Spider-Man fan and I’ve read the Spider-Man comics for about 33 years. So Spider-Man: Into the Spider-Verse was a movie I was quite keen to see. While the Spider-Verse comics were a novelty I never really got into, the Ultimate Spider-Man comics were something I quite enjoyed. Miles Morales’ Ultimate Spider-Man could easily be dismissed as a Spider-Man knock off, yet Brian Michael Bendis gave him enough unique personality, drama, and humor to make him one of my favorite Marvel characters. And I think Spider-Man: Into the Spider-Verse captured almost everything I love about the character. On top of that add the pairing of him with an older, burned-out Spider-Man and you have a funny and engaging duo. In this movie, Miles is a young teenager at a crossroads in his life while the Peter Parker we meet is jaded and has ventured down the wrong path. Miles is a Hispanic/African American kid into music, graffiti, and girls while Peter is a white, middle-aged divorcee. Miles is idealistic and seeking guidance while Peter is wallowing in self-pity and fleeing the responsibility he has so often preached about. Come to think of it they are a lot like Rey and Luke in The Last Jedi, but funnier. And the two characters, voiced by Shameik Moore and Jake Johnson, are a great comedic duo. Johnson’s Parker has let him go so far mentally and physically, yet he’s followed around by Moore’s Morales who is like a bouncy puppy begging for attention. But we see the heroic potential under the surface with both of them and when it finally emerges, it is a great moment in the story. While humor is the centerpiece of the film, there are some surprisingly emotional moments as well. The relationship between Miles, his father, and his Uncle Aaron has some twists and turns that will surprise anyone not familiar with the comics. It’s downright Shakespearean. There is also a twist with Spider-Man himself that is going to shock unsuspecting fans. And though Miles Morales is the focus of this film, there are some deep moments between Peter, Aunt May, and Mary Jane as well. In short, there’s a lot here to engage both comic fans and movie fans as well as children and adults. The animation in Spider-Man: Into the Spider-Verse is quite stunning. It’s like a comic book was literally thrown onto the screen. There is colorful, frantic action. There are beautiful, artistic backdrops. And periodically there are word balloons and text on the screens that add an extra bit of emotion or humor to the scene. It’s one of the more visually creative films to come along in a while. Spider-Man: Into the Spider-Verse also revels in its comic roots like few other comic book movies. There are Easter Eggs all over the place for fans. They reference the Spider-Buggy, the terrible popsicles, the comic books, the Christmas albums, the live action movies, and more. There are other more subtle references as well. When a character scrolls through contacts on their phone, you see familiar comic creator names like “Bendis” and “Ditko”. And as you might suspect, there is a cameo by Stan Lee. It might actually bring a tear to your eye as it’s not just a brief cameo. Stan actually has some especially poignant dialogue. Finally, as you might expect, there is a bonus scene at the very end of the film. 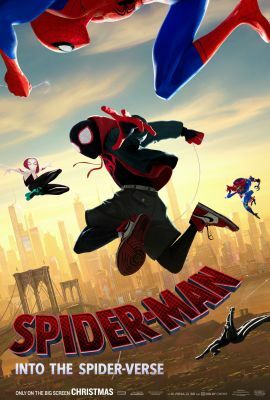 I will not spoil it here, but it has a cool, familiar Spider-Man character, a great voice actor, and a hilarious twist that will have everyone leaving the theater laughing. If you have to pee at the end of the movie, run out fast and come back. You don’t want to miss it. I’ve seen a lot of people saying Spider-Man: Into the Spider-Verse” is the best Spider-Man movie. I would disagree with that assessment. It’s a great Spider-Man movie, but not the best. The biggest weakness of this story is the other Spider-People, and that’s mainly because they have little time to be developed. Spider-Woman / Spider-Gwen is a cool character with an interesting design, but she’s given little to do in the story. The same goes for Spider-Man Noir voiced by Nicolas Cage and Peni Parker. And while I’m incredibly impressed at the audaciousness of including Peter Porker, The Spectacular Spider-Ham, I have to say he doesn’t fit into the story alongside the other characters. The core of the story is the relationship between Spider-Man and Miles Morales and these other characters just take away from that. I know Spider-Gwen is getting her own movie, so hopefully she can be developed more there. And while 4/5 of the movie is pretty great, the ending devolves into a typical superhero free-for-all that tends to get rather boring. Only when the finale focuses on Miles does it get engaging. Spider-Man: Into the Spider-Verse is a great introduction of Miles Morales to the public in general and I think audiences are going to eagerly anticipate his appearance in the Marvel Cinematic Universe after this movie. It’s funny, engaging, and action packed. This is a great holiday film that the whole family can enjoy together. 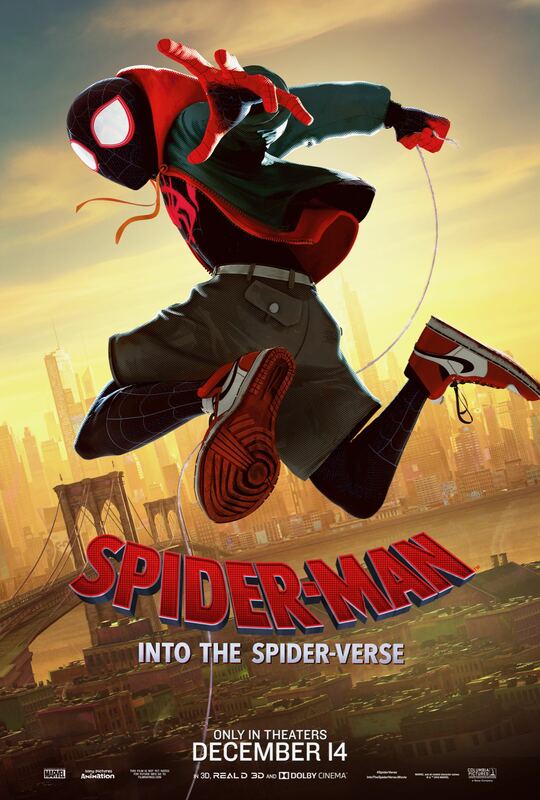 The post Spider-Man: Into the Spider-Verse Review appeared first on ComingSoon.net.